Formerly called the Beaten Docket. Have you got Google Earth on your computer? If so, then download the Google Earth view of Brennans Bar. Is this the wrong position for Brennans Bar? If you think so, then modify its position. Click / Tap the button above to get directions from where you are to Brennans Bar. Organised Birthday party for over 25 people and haven't stopped talking about it. Food was gorgeous, staff were amazing and the entertainment was the best we have heard in long time. Music played covered all ages, such a fantactic night, we will definatley be back for more. and best barstaff of belfast.love this barr. bar has been known as the beaten docket for an eternity part of belfast folklore yet they go and change the name to something as boring as brennans! BRING BACK THE BEATEN DOCKET!!!! Went there a few years ago, what a great atmosphere inside the bar. we sat drinking all day and just relaxed and enjoyed the atmosphere and friendly banter from the bar staff. 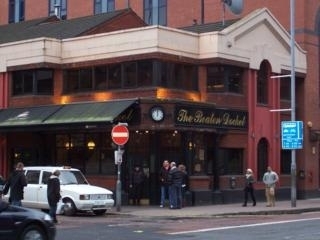 Great pub, one of the best in Belfast. Nice enuf wee bar n gud craic but jaysus the burgers was mingin! Greasy cold an dried up. Feck sake wise up! Worst food I have ever had! The so called irish chef can't even make an Ulster Fry! Sausages dry and inedible and tasted like they were cooked the day before, egg burnt, bacon rubbery. Absoloutely disgusting! Lunch on20 June 2011. My daughter had chicken goujons n chips, superb. I had mixed grill, best I've ever had in my near 60 years. Steak was as ordered, tender and lean. Gammon steak was unbelievably tasty and tender. I've never had gammon steak this good, even my own!!! Garlic spuds scrumptious. Value for money great and the server was courteous, pleasant, had great eye contact and made us feel really at home. Will come back for the service alone. It's all right if you like this sort of thing. Lovely architecture inside, looks better than the exterior. Not as "touristy" as some other establishments nearby. Surprised its not more popular than it is. Maybe the name puts some people off, thinking is just all about gambling etc ? But it does get the crowds in. Better quality music at nights would help? The bar is a real bar - I mean you could go in and have 5 or 6 pints and totally relax - no-one will bother you. I was there today from 1pm till 4pm, had a few bets on the horses next door and then back in for a few ice cold pints of harp - true perfection. All the while there was not one woman moaning about food service or one idiot spoiling it for the rest of us. Just nice beers, good polite company, horse racing and generally a really relaxing time. Always EXCELLENT place to be and the bar men are great. Thanks for the many nights lads!!! On a recent vacation to Belfast, Ireland, whilst staying in the city, I called to the pub for a beer and some food. The service was good and the food was excellent. The only thing that ruined the visit was that a customer (by all accounts), a thick set guy with a goatee beard and a moustache insisted on pestering me with his life story of the many soccer clubs he had played for Ireland and how he should have ben a professional golfer. I was relieved when this guy, during one of his many sorties to the track office next door, became engaged in a scuffle with a vagrant in the foyer of the bar, all because the tramp asked the sporting superstar if "He was glad to see him" Both were ejected by the efficient bar staff and I remained to have a very pleasant day in what I would consider to be one of the best bars in Belfast, Ireland. me and my partner went there for lunch not long ago and the restaurant upstairs was lovely very nicely decoratorated and their menu was really good, alot of choices and only cost £3.75 a meal. i ordered the soup with baquette and my partner steak burger and chips. Firstly the waiter brought my soup out in his hands with not even a plate underneath it and then left until another 15 mins when another server came up and serve us both our meals together, this time it was serve on a plate with the baguette together. very nicely presented and the portions were really big... food was delicious cant complain* very relaxin atmosphere at that time of day.... only wish the services was as good first time round, dnt no what that other waiter was thinkin. 17 of us were there from scotland for a 40th birthday party, 18/01/08. it was majic the disco upstairs was brilliant dj patrick was brill played anything we wanted. great pub and staff good to even though they had to politly tell us to stop blowing our whistles. would recommend it for a good nite.